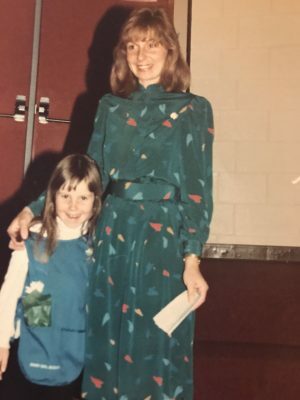 My mom will have been gone twenty-one years this week and my daughter’s simple and sweet words easily tugged on the threads of my grief. It was difficult for me to respond to her without feeling a heaviness in my chest and hot tears come to my eyes. Part of me felt childish and emotionally weak to become so easily saddened over something that happened so long ago, I have lived more of my life without my mother than I lived with my mother. I felt the threads of lies in my story in that moment—threads of lies that whisper I have to grieve with a smile. Standing in front of my daughter over a bowl of Lucky Charms, I felt shame to express the brokenness I still felt in my heart. It amazes me how these lies are so easily tangled-up in my grief, the shame from my past so easily distorts my present state of Christ-confidence and shalom-peace. Vows of self-protection as a young high school student still trickle into my present reactions as an adult. With intention, I have to discern when the threads of grief I feel in the present are tangled-up in my old patterns of fear, shame, and self-protection. I all too easily forget the new freedom that is mine in the gospel. My threads of grief are being transformed by the Spirit that lives inside of me—behold, God makes all things new (Revelation 21:5). In the gospel, when I mourn, I am comforted (Matthew 5:4). God is near to the broken-hearted and he binds up my wounds Psalm 147:3). Because of the new life I have in Christ, I am freed from the yoke of slavery of shame, fear, and self-protection. I can let the heaviness of my wounds, lies, and vows unravel away. God gave us a spirit not of fear but of power and love and self-control (2 Timothy 1:7). There is power over fear and shame in the gospel. This week as I fight to walk in the newness of life—a gospel that frees me from the lies that tangle-up my present threads of grief—I am fighting to remember that I am free to be childish and emotionally weak. I am free to be saddened when I feel the threads of grief. As I little-by-little walk in transforming my grief, I desire to be intentional so I do not pass on a tangled-up gospel to my daughter. If I respond in the patterns I developed as a young high school student, I am still tangled-up in the old story. The gospel gives me a new story to pass on and in this new story, God doesn’t require me to have it all together all of the time. 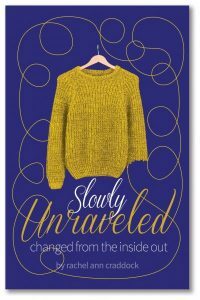 When I feel threads of grief over the every day moments of Lucky Charms, pigtail buns, and lacing up high-top sneakers—I want to pass on emotions that are deeply woven in the gospel—I don’t want to pass on the woundedness of my old self, I want my pain to be transformed—I want to pass on the freedom of the gospel to my sweet children in the every day. God really is making all things new.